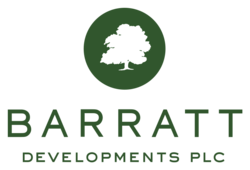 Barratt has been building homes for more than 50 years. In that time they have grown to become one of the nation's largest housebuilders with more than 4,000 direct employees and 25 divisions throughout Britain. They build developments nationwide, from Aberdeen to Plymouth, helping to meet housing demand in towns, cities and rural areas. They provide homes for all market sectors, plus homes for rent and shared ownership, and are leaders in brownfield development and urban regeneration. They operate under two strong national brands for house building –Barratt Homes and David Wilson Homes. They also have a strong regional brand –Ward Homes - operating in Kent and the South East. They also have a commercial property development business, Wilson Bowden Developments, which is focused on retail, leisure, office, industrial and mixed-use schemes.